The third set of semi finalists attempt to impress the judges and viewers at home. After each act has performed the judges give their verdict on what they have seen. UDI, Gracie Wickens Sweet, The Kingdom Tenors, IMD Legion and Jamie Raven all manage to impress tonight. Britain's Got Talent is a reality talent show hosted by Ant and Dec. Any sort of entertainment act is able to enter the competition and hopefully impress the judges and make it through to the final stages of the competition. 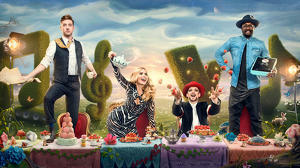 The series winner's prize is £100,000 and the chance to perform at the Royal Variety Show. The judges on the show are Simon Cowell, Amanda Holden, Alesha Dixon and David Walliams.